gooood team interviews creative from all over the world. Your recommendations and suggestions are welcomed! 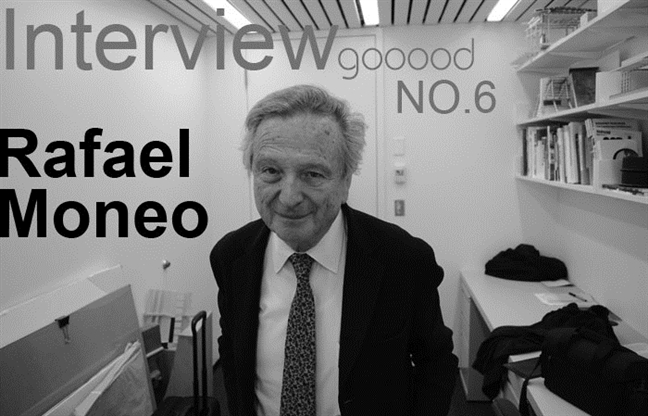 gooood Interview NO.6 introduces Rafael Moneo. For you what is architecture? I think that those questions are the worst to be answered. Architecture is how would I define what architecture is. Architecture is perhaps is something that speaks about the structure and the order or the chaos which is behind the world we live on. And either you want some source about the architecture coming from what the profession is. I would say in this artificial world that is the big world around us is what architects have done and what architects have done is try to establish the conditions to handle and to manage and to make life possible in the world; Therefore, in this moment to speak about architecture means to speak either of the substantive that is behind architecture, that speaks about these metaphors, that implies that the entire notion of structure and order behind whatever kind of being or just the profession. Therefore is difficult in these very much general questions to be answered easily. And, actually the next couple of questions will be more specific. It’s going to be more about one of your classic projects, which is the city hall of Murcia. So, it’s completed in 1998, now it’s been 15 years. Now that you look back to this project, what do you feel? Is there anything you want to change? Probably, I would leave it the way it is. The brick is earlier like that, you’re probably you are right it finished in 1998. I didn’t remember now, but it was designed 4 or 5 years earlier, and that means that it’s a project which speaks out this problem of making buildings in very well-defined urban atmospheres and urban cities. In this case, the building encloses the space, but mostly ties to establish the dual counter point with the cathedral. I thought that the cathedral was something that gives tableaux that was the structure as the tableaux used to be. And I thought that perhaps that something like much more abstract with tableaux out of old iconography that the cathedral had that still would be able to give to the rise and to the sense of whoever was in the plaza the sense that belonging to the same space and that was it. Then, there were other considerations I like whether don’t put there any reflective material better than glass is was just stone, better than the huge volume it would be better to match those that existed close to it and then we needed to provide the right alignments all these things seems to be that are there also and lately and this platform is the first urban space in the city. And then the plaza was completely dominated by the charge either the ivy shop, the cardinal or the cathedral all these this is more people’s houses that were in one of the sites. I thought that along with the mayor to be also present in this space public justifies the balcony that the tableaux have. Therefore, I would say that more or less, I will be back into the same features the design like that has. After the project finished, the facade become an important topic, lots of people discussing about it. I feel like the facade has really a degree of freedom from the main volume. It’s detached and also independent. So, why did you make it independent in the first place? Well because I think that the facade belong more to the plaza than to the building itself. And, therefore, the facade shows the role that it wants to play in the entire space of the plaza. Had the facade to contrive what was happening behind in the actual enclosure of the building it would have perhaps limited the people whoever of was the plaza of the actual role that the facade was playing. And, therefore, detached the facade still follow to me although still I think is what ought to be done. And also about the design of the facade, so people were reading it as a 3 part of the classical order, and there are lots of other readings about the facade. And, in your book of the remark of 21 works, you said the facade was random, which is very different from people’s old reading. So, I’m wondering, how did this kind of facade respond to the history? How did you determine the pattern? In a way, I don’t think that because of the autonomy of the facade. Because the facade works almost independently, but with the big balcony that makes the whole there, I guess the texture was what matters. And this texture seems to me was much more established by the vertical and horizontal order. The relationship between the horizontal pieces of concrete holding the columns are those who are actually introduce the natural order of tableaux facade that is related with the building that are following the status of the building behind. And yet, I guess that it was much more lively and free and if you wanted even lyrical, the facade emphasized an issue that architecture has explored many many times that is the fact of numbers and rhythms and those rhythms and relationship with music that obviously the facade has, is asking more for these not structure it vertical greed. The corners of the pilasters are so important that is just creating this intersection between and verticality and horizontality that yesterday Scott Cohen was talking about in his lecture. So, you mentioned about number and rhythm. Could you be more specific, how did you determine that? I don’t think that I can to answer you very frankly. Probably, numbers are related to say to the pressure of having a specific number of columns and then buildings are much more established by chance. In a way, I have used to do in other projects; I have used the Fibonacci Sequence. It isn’t the case in this facade. It is much more visually controlled. I went through making many models, and the moment I indeed liked it, the true proximity between two columns and how the vertical alignment defined for them was broken or not. It was much more visually intuition on the overall facade was actually is different than what the facade ended up being. Someone compared Sana’s building in Germany, the one with the box, the facade, with your facade. How will you respond to that? I understand the community. I wouldn’t think that they say a direct connection, and yet, the sense that the feeling of these I wouldn’t say just pictures, the sense that you can’t prevent falling into repetition by just making the elements to dance in the plane. That is what both projects have been done. I have never heard about that till now. I wouldn’t’ say that is out of place that the suggestion that you made. The column at the entrance is very interesting because the outside is a rectangular column and when you enter the entrance it becomes a circle column. So, what’s the idea behind that? I think I have said something about that. I wanted the building to be in the plaza, but I didn’t want the building to have such a powerful presence in the plaza as had both the cardinal palace and the cathedral. If that was going to happen better to give a side entrance to the building. By giving a side entrance to the building you are reducing then you are not just entering an element that is obviously had the building has a gate on the plaza, the door will taken some mandatory relief in the entire facade. Instead, by giving the door a design, I keep the autonomy and the integrity of the vertical plane of the facade as well as I established the contact between the building of the entire urban fabric. In a way it is addressing the city instead of addressing the plaza. It seems to me that it enters the element of complexity and that makes both the street and plaza more lively. Besides a great architect, you are a great educator, what is the most important thing for students to learn when they are in architecture school? Well, what I would recommend the most to the students will be to look at buildings so acutely. I will be say critically, to explore and to remake the experience of building the building by looking at it and so if you do that you are able to learn continuously. Indeed when I go whenever I immediately, because of my education and my practice, I start to put myself in the shoes of the architect. And it seems to me it’s a way of remaking by thinking beside the architect what the building is you are making. You are making an experience you didn’t have before and that experience this is a profession that has to do with experience as well. Therefore, that seems to me that is still a good way of learning. Just standing in this concept, this idea of learning from the buildings I saw the other day for my second day, the Brooks exhibition in the Museum of Modern Art in New York. And then, I was surprised seeing how he goes directly from having rendered all those buildings from the mostly Greek Roman Temples, Tuscan tombs, Medieval cloisters, that the end just by throwing so carefully being impregnated and learning from them he was able to go almost directly without any more experience in producing one of the nicest buildings in 19th century architectural history that is the library of St. Genevieve in Paris. Obviously, and coming back with your question, I see that the way I believe is better to be an architect is when you are adding to the practice of your profession. These intellectual commitments that is the way of enjoying more and more of what you do. You should oversee what is just the shared practice of the profession and trying to give much more spicy and much more lively content that is provided by just thinking the role your work plays in the world of architecture. You had an amazing career as an architect. I’m just wondering if there were tough times in your career, and how did you overcome those tough times. Well, for us, architects in Spain, the crisis is a serious event because you know our country move from great hard time of dictatorship into free world democracy. The role of the architects was very important in helping the society to move on.And architects have enjoyed in Spain in the 80s and 90s making so many different buildings for an evolved society. So, architects did a lot of social housing, but also schools and hospitals, museums, libraries, railway stations – the country moved on. We see architects boomed, and enjoyed having a flourishing practice. In spite of being in contact with other countries, my practice mostly has been based in Spain. Our practice has also assented, and we need to think about much more restricted problems. Many large project and much more important public projects have been stopped, but I think that there is still room for architects to try to transfer their commission they have now days the intensity and the depth that perhaps was started to be lost in the these discipline – were used to get things too easily and to have time for patience will not be bad. For many young architects probably is going to be time for foreign experience and perhaps they will come back to their country after having learned or having had the opportunity to know how life and practice works. Chinese market is quite big. Lot of architects go to China to practice in China. Unfortunately, I don’t know China so well. Actually, I don’t know it at all. I have travelled 3 times to Japan, and I travelled once to Hong Kong. I like Hong Kong a lot. It seems to me one of the nicest cities I know for many things – for the wonderful geographical conditions it’s seated on, but also by the energy and by the beauty with which Hong Kong has answered to contemporary architecture. Whoever comes from a country where let’s say tower was still conveying symbolic content and instead Hong Kong you see tower was trying to provide dwelling people and then losing all these let’s say overdone meaning and instead going back to using for intensively the site. That was for me why that was an unforgettable experience. Sichuan that is the only thing that I know from China. I wouldn’t say is so good. I think that it is very pale trying to replicate what Hong Kong is in a rather let’s say magical condition and it hasn’t neither for the urban setting not because of the work, it is born with the liveliness it does it is much more bureaucratic, officials, and somehow you realize that they are trying to compete, and when you see that obviously, but I imagine that it doesn’t Sichuan at all. Sino representing the past geographical conditions in the regions, populations, even racial differences among North and South. And, I indeed it is a duty to know Beijing, Shanghai, Canton and I hope I will do it one day. Talking about the presence of Western architecture in China. I wonder what China is buying or accepting what the Western patterns so a bit too much and critically. You have such a powerful culture, I wouldn’t say beautiful, but powerful culture. Western culture I think that you should or you have the roots and the strength for doing something that shouldn’t be so directly borrowed. I see a lot of architects making China let’s say a marketplace for their practices but no more than that. I guess that to architecture is used to have born just in a strict contact with both the people of the land where they have been raised. I think that something that is missing in China. I wonder what we Westerners are just making the wisest thing when working there indiscriminately. I think that the Pritzker prize winner last year, Wang Shu, regardless of the judgment of his work, politically speaking, or say something how China ought to look on itself. Is it a call to your attention how much you are able to create， because by so doing I am sure that you will do something more let’s say don’t mean more profound, but something that that is much more felt as needed and is much more felt that just standing on the ground, the landscape, and the soil that is there than would like to be. So, what’s your next plan? Well, unfortunately, I graduated in 1961, I travelled to Denmark, and to Rome, living in the Spanish Academy of Rome. But, since 1965 when I started my practice and now, theres almost 50 years. You are considering that I graduated in 1961; therefore, as much as I feel more eager and make work. I would like to work as an architect. I think retiring as much as I have for pleasure – overall pleasure. I still feel pleased when seeing over the drafting boards of the computer screens of the people working in the office. I still feel myself rewarded and attracted by the work that we do. And in the meantime, lastly, I will keep alive my practice. But, to tell you the truth, I am not merrily running. I know that my practice has been limited. I have not I don’t have a very large practice. I have between 20-30 people at most. But then, I have been able to have enough work, and I have had the fortune to being involved in enough projects to feel that what I wanted to say and what I could say as an architect has been said; therefore, I am not in this moment let’s say mad for just getting any work. I hope in the meantime to keep working as much as my interest is alive, and I hope in this moment, I would like to satisfy and live myself relaxed. That anybody knows better than oneself the flows of what you didn’t achieve. And therefore, I would like the fulfillment and the achievements I am looking for and following the directions of research of study that are attracted more to me. Besides that, I would like put clean some papers I am working on. I had many things that were published but that are now difficult to be found and put some writing together. I need to finish a small booklet that I hope will be more clear about the concept of arbitrariness and necessity these kind of counterpoints. And then, besides that as you probably know, for the past 12 years, I have involved in making wine. And I am starting to put wine on the market, and I would like to pay attention to that because that links you with something that has substantiality of what is not just only human product.It is indeed a human product as much as in the way that you deliver the wine is so important for what the wine ends up being. But it is also the earth, the soil, the weather, the unexpected conditions – to feel all those contingencies just making what contains about you is also so rewarding. Then, I have a rather busy agenda for the years to come.